In 2005, UNESCO, in order to raise awareness of the wealth and significance of A/V materials and collections as documents of tradition, heritage, and culture, as well as to raise awareness of issues regarding preservation and access, declared October 27th as the World Day for Audiovisual Heritage. In the years since, institutions ranging from libraries and archives to cultural centers to A/V professional associations have used this day of consciousness-raising to share and showcase how audio visual media enriches our understanding of history and heritage. Home Movie Day is an example of how our heritage is expressed through media. 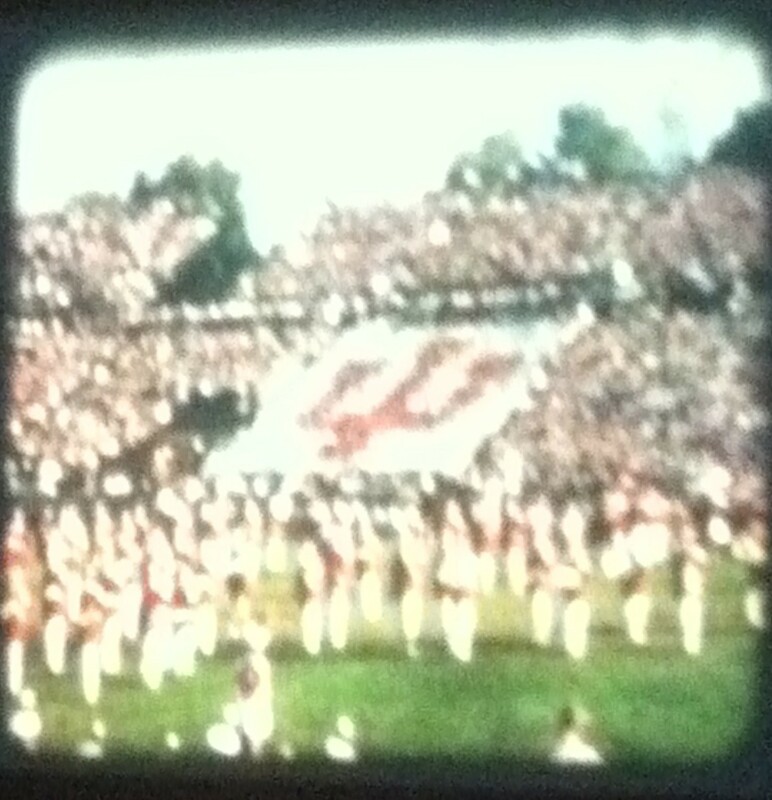 Here is an image of an IU football game from the 1950s, taken at the IU Cinema on Home Movie Day 2012. Last year, for example, The Israel National Commission for UNESCO took October 27th as a day to publicly screen rare and special materials from the repositories of Israeli film archives in seven Cinematheques throughout the country. The Polish National Audiovisual Institute planned its yearly Culture 2.0 conference around World Day for Audiovisual heritage, with researchers and activists discussing ideas of heritage, media, and cultural literacy. And the Philippines, the last standing country without a national film archive, released new plans for the National Film Archive of the Philippines, in Manila which, as of this year, has just begun and, in fact, participated in the 2012 Home Movie Day. The theme for this year, which is hosted by the International Association for Sound and Audiovisual Archives (IASA) is “Audiovisual Heritage Memory? The Clock Is Ticking.” This statement highlights the belief among A/V professionals that the next couple of decades are of critical importance when it comes to preserving A/V materials. As Mike Casey and Bruce Gordon noted in “Sound Directions: Best Practices for Audio Preservation,” sound archives (and, it could surely be argued, film and video archives as well) “have reached a critical point in their history marked by the simultaneous rapid deterioration of unique original materials, the development of expensive and powerful new digital technologies, and the consequent decline of analog formats and media.” In other words – materials are getting older, more outdated, and are harder to fix. Here at the Indiana University Library Film Archive (IULFA), we struggle with these issues of decay and obsolescence every day. It’s a challenge that can be particularly poignant and potent when working to preserve and make accessible materials that represent the cultural heritage and history of the area where we live. Handling unique or rare regionally produced materials such as the Indiana University Audio-Visual Center educational films from the 1940s-1980s is unambiguous evidence of the historical and cultural relevance of audiovisual materials. Those interested in a sampling of some of the educational materials we have available that deal with the Midwest’s cultural and economic heritage in particular might want to take a look at the following films, digitized and made accessible on the IULFA website. These represent only a sliver of the Hoosier-centric materials we are currently accessioning, cataloging, preserving, and digitizing, and we plan to highlight some of this films in upcoming blogs, so stay tuned! Provides an anecdotal account of the history of the American railroad in the Midwest through personal interviews and historical photographs. Features stories fondly recounted by old-timers who grew up along the tracks in Iowa, and highlights the importance of trains to daily life while capturing their aura of mystery and excitement. It is impossible to live in Indiana and not be aware of the cultural, historical, and economic significance of the limestone industry. This film, produced by Indiana University’s School of Education, explains and simulates the formation of sedimentary rock, focusing on the importance of limestone as a natural resource. “In The Rapture” documents a local production of a traditional black church musical drama portraying man’s struggle to resist the temptations of Satan and follow Jesus. The companion film features eight members of the “rapture family” discussing the drama’s significance with Dr. Herman Hudson, Dean for Afro-American Affairs, and Dr. William H. Wiggins, Jr., Professor of Afro-American Studies, Indiana University. Traces the history and significance of New Harmony, Indiana, from its communal origins to its contemporary renaissance as an historic landmark. A must for anyone interested in vernacular architecture and local history.